Many people find climbing Mt. Fuji the most difficult thing they have ever done in their entire life and at the same time the most rewarding. To climb Mt. Fuji, to be literally above the clouds looking down on the landscape and to witness a breathtaking sunrise can be the experience of a lifetime. However, do not underestimate the climb. Do not believe the blogs and others who say, “Climbing Mt. Fuji is easy.” While it is true under ideal conditions that some people have climbed Mt. 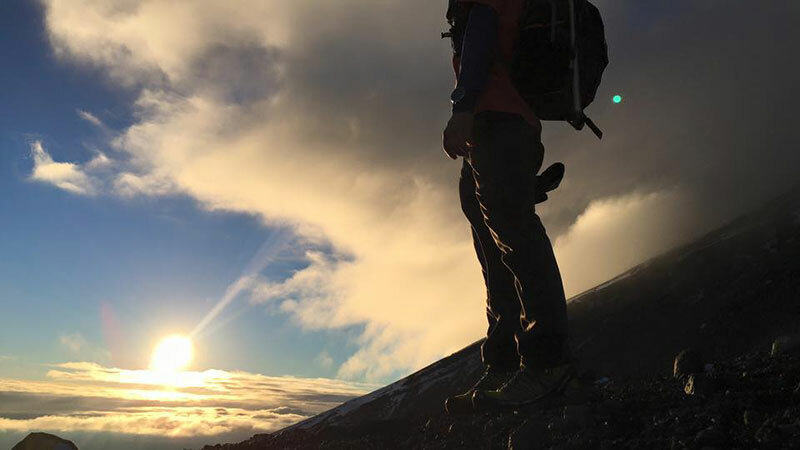 Fuji in sneakers, jeans, and a sweatshirt, there are still many more who have attempted the climb using similar inadequate provisions and were miserably unsuccessful. Many people ascending Mt. Fuji for the first time underestimate the climb in three key areas. First, they miscalculate the total time it takes to climb Mt. Fuji. Typically it takes between six to seven hours to climb up the mountain and another three to four hours to descend. This is if you are leaving from the 5th station and taking the most popular route. Thirdly, many underestimated the elevation gain, which is approximately 1,500 meters or 4,900 feet from the 5th station on the Yoshida Route to the summit. This rapid ascent tests the limits of Mt. Fuji Group Pictureyour physical and mental fitness. The air thins out as the elevation rises; thus, walking becomes difficult. Regardless of age, with proper gear and preparation, reaching the peak of Mt. Fuji is possible and extremely gratifying. As you stare down at the world below, a huge sense of accomplishment can overpower you. And when you realize just how high you have climbed, it is truly a satisfying and memorable experience. It’s hard to put it in to words, but sometimes when you watch the sun rise from the summit on a clear morning – it is almost a spiritual experience. For your reference and safely, we highly recommend getting a copy of Climbing Mt. Fuji "A Complete Guidebook" before you climb Mt. Fuji. This guidebook will help you in your preparation, plus there is also a chapter on pre-climb training.